CEO and Co-founder Matt Caywood said by curating transit information, people can make better and more efficient mobility decisions. Ten years ago, in the neuroscience lab at the University of California, San Francisco, a graduate student was developing experiments involving an unlikely interest: transportation. Matt Caywood, a Chicago native, was always fascinated by public transit. He had previously built himself a trip planner for London Underground (a good four years prior to London launching its own planner), and at UCSF, he built his own tools to determine the most efficient transit options home after late nights of studying. This passion for tech-driven mobility solutions led Caywood to Washington, DC, where his infatuation with transportation transformed into a business. In 2013, Caywood and co-founder Ryan Croft launched TransitScreen, a company that curates local, real-time mobility information — including bus and rail times, wait times for ride-sharing apps and the proximity of bike- and scooter-share systems — and displays it on screens in commercial buildings. The screens are located across more than 40 cities in the U.S. and Canada, with some even sprinkled throughout the U.K., Ireland and France. The growth of TransitScreen followed a true startup trajectory, having started in Caywood's garage before moving to the former 1776 incubator, and eventually into its own office. Caywood describes the company as "scrappy" and touts its most strategic business decision — to sell to real estate clients. The TransitScreen office in Washington, DC. "The cities are advocates for us because we’re helping them by providing public information that anyone, no matter who they are — young or old, rich or poor — can get," Caywood said. "But what we do instead is work with the real estate industry and with employers to put that information into as many public and public-ish locations as possible." TransitScreen displays are most commonly found in commercial offices, apartment buildings, hotels, restaurants and university buildings. "It's a very different model from, say, a LinkNYC model where they have to spend hundreds of millions in capital costs to roll out their network then find a way to recoup that," Caywood explained. "We're able to make a very large impact on smart cities while still being a very small and lightly-funded company." 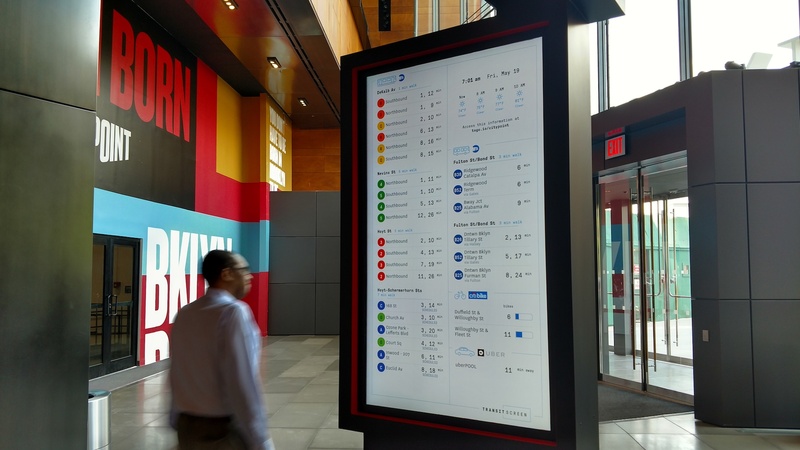 By offering transportation information on a public display, the TransitScreen team is aiming to preserve a valued asset of the everyday public transit user: time. A recent report from McKinsey Global Institute found that, by 2025, the cities that deploy smart mobility applications could reduce average commuting times by 15-20%. "When a resident looks at real-time traffic data and decides to set out at a less busy time, she avoids adding another car to the road that would worsen congestion for everyone," the report says. "Millions of individual decisions and actions add up, making the city as a whole more productive and responsive." Caywood said by giving city residents the option to view this real-time data right before walking out of the door, it alleviates the responsibility of looking up the information on your mobile device. And, while TransitScreen has optimized its service to be responsive to a mobile screen, Caywood said only one in every 10 public transit riders ever checks their phone for such information. "Most of the trips that you’re going to make are starting at a particular location — your home or your work. Being able to provide the information at a glance in an efficient and easy-to-use manner, that’s when you have the biggest impact," he said. Of course the company faces a lot of pressure to keep its information accurate and up-to-date as new mobility solutions enter the market. Caywood said this is a "core goal of our product," and is accomplished through active partnerships. "Our approach is we want to work with all of the different mobility providers to inform our audience ... about the options that are available and the choices that they can now make," he said. "So our approach to that has been to partner with them, and we're now seeing that as we've established our presence in the space, people are kind of now coming to us with data and saying, 'What does it take to get on TransitScreen's platform?'" Even with the influx of new electric scooter and dockless bike companies coming online, Caywood said TransitScreen is in "active conversations" with everyone in the space. In addition to the traditional TransitScreen platform, the company has also developed MobilityScore, a tool that ranks city locations based on access to mobility services. Similar to tools like Walk Score, MobilityScore measures how easy it is to move around a city by scoring any location or address from 0 (no mobility options) to 100 (excellent mobility options). "It’s based on actual data and not just schedules, so it’s the only tool of its kind," Caywood said. And while the tool is only in its beta phase, it has already been rolled out in most of the top 100 largest cities in North America. The company has also worked with real estates sites like Rent Jungle to optimize property and rental searches. Caywood called MobilityScore an "intrinsically international product" and said TransitScreen will continue to roll out the tool in new places. In a blog post, the company also called the tool "future-proof" and said it will be continuously updated with information on microtransit, autonomous vehicles and mobility-as-a-service. The MobilityScore results for a location in the Dupont Circle neighborhood of Washington, DC. From its active social media accounts to regular e-mail newsletters, TransitScreen is vocal about its desire to grow alongside the cities where it operates. Caywood hinted the company has a few new offerings in the works, and is continually looking for ways to "make the TransitScreen experience more relevant to the people who are viewing it and using it." And aside from internal strategies, Caywood believes the evolution of smart cities will help the company stay along a successful growth path. He said his understanding of a "smart city" is one that takes data and translates it into useful information — which is at the core of TransitScreen's business.